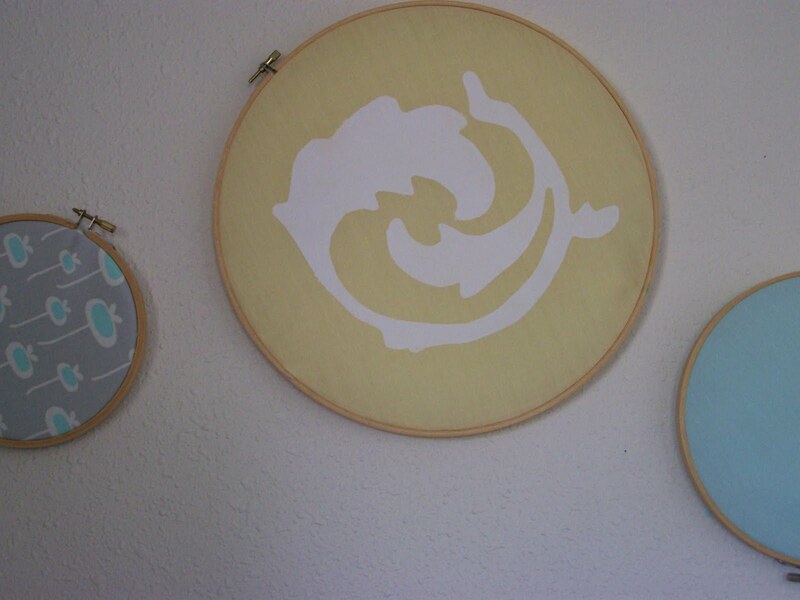 If you remember a little while back I shared some of my favorite ways to display fabric. 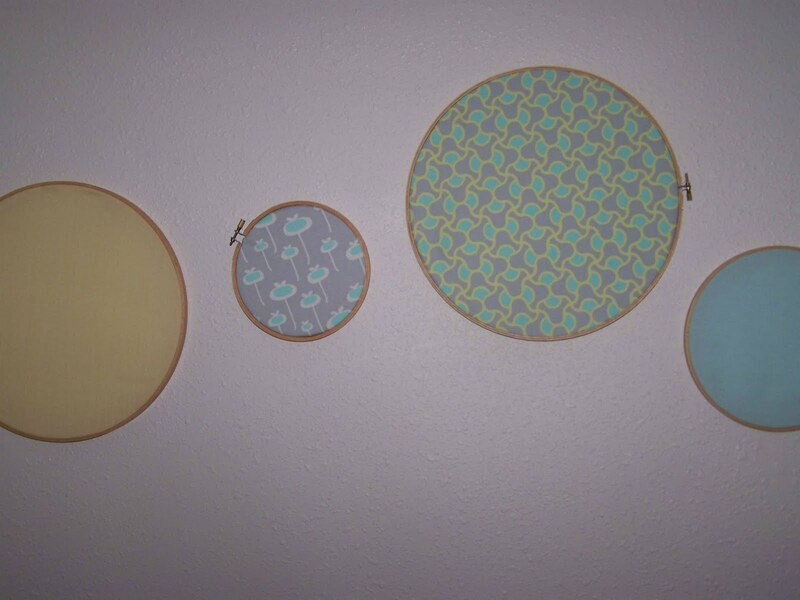 I absolutely love stretching fabric in embroidery hoops, it is such a quick way to add a bit of color to your walls. I also shared a couple of photos of a few hoops that I have hanging in my craft/computer room. 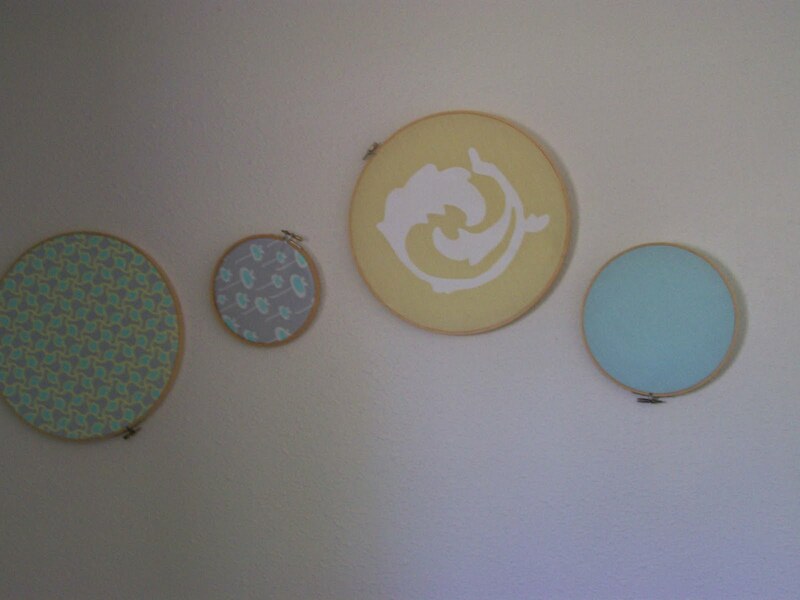 I really like them on the wall, but two of them were solid fabrics and needed a little something more. Originally I thought that I'd create a freezer paper stencil and make a silhouette of my son's face, but I decided against it (mostly because I can't get him to sit still without looking directly at the camera). So instead of the silhouette, and instead of doing a large initial (which I also considered), I decided on a fairly simple shape that would add a little something extra. I found my image on a website called craftsmanspace.com I have referenced them before, but they have an archive of free patterns for download. I think that it is primarily a wood workers website, but they have beautiful scroll saw patterns that can be used in a multitude of projects. I decided on this rather decorative organic shape that was simple enough that I wouldn't be cutting out tiny pieces for hours on end. I started by pulling my design element into Photoshop and resizing it. After I had my shape the desired size I printed it off, laid it underneath my freezer paper and traced my image. I know that everyone out there has their own tutorial for freezer paper stenciling, but if you've never tried this project here is a bit of basic information. You buy freezer paper in the paper goods section, near the aluminum foil or plastic wrap. It comes in a roll and has one matte papery side, and one shiny wax side. The wax side adheres to the fabric, so you will want to trace your image onto the matte papery side. Because we are making a stencil the actual shape or image is going to be removed leaving a border that will serve as the stencil. After tracing the image I made several x's in my image area (the portion that will be cut away). This step just helps me keep things straight. I know exactly what is to be removed and what is staying. 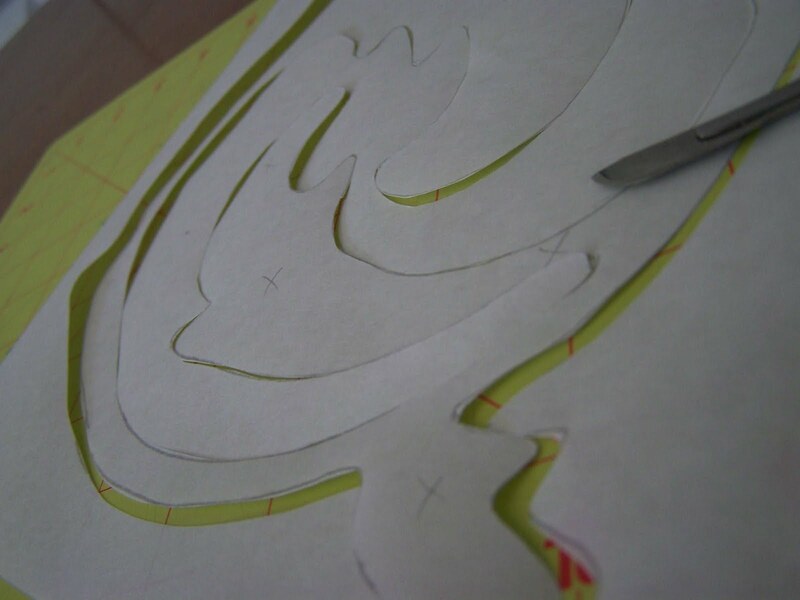 Using an X-acto knife I carefully cut away my image (be careful not to cut into the stencil area). Now tear off a piece of freezer paper that is as large as your stencil. 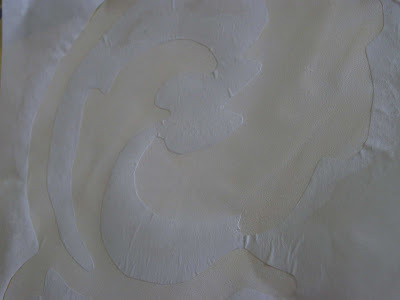 You will place the solid piece of freezer paper beneath your piece of fabric with waxy side toward the fabric. Iron the fabric to adhere this piece to your fabric. This step stabilizes your fabric and will prevent paint from seeping through the fabric. Now center your stencil on top of your fabric adjusting any parts that might need repositioning. 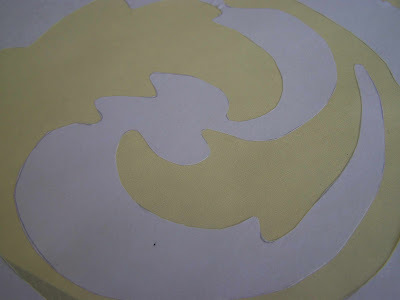 After your stencil is laid out as you want it adhere this stencil to your fabric using a hot iron. 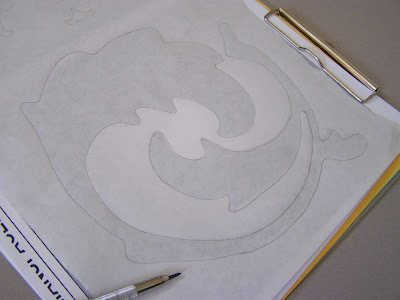 Make sure that all of the edges are adhered, any puckers in the paper will result in paint seeping beneath the stencil. Once your stencil is securely attached it is time to paint. Now if you are creating a freezer paper stencil for a piece of clothing or an item that will be worn or washed, you will want to make sure and use a flexible fabric paint. This can be purchased at Joann's or Michael's for a couple of dollars. I used Tulip brand fabric paint and it worked well. In this particular project you could probably get away with using an acrylic paint just because it will not likely be washed. Apply thin coats of paint using an up and down motion. Allow paint to dry between coats. I ended up using 2 coats of paint. There are special round flat stencil brushes available, but you could get away with using a normal sponge brush. Allow your paint to set according to instructions. Tulip brand paint is supposed to be set in 4 hours, but other brands require heat setting with an iron, so read the package during use. After the paint has set you can remove your freezer paper. This is always a bit exciting/nerve wracking to me. Simply pull off your paper on the front and back of your fabric. If paint has seeped under your stencil, which it always seems to do to some degree or another, you can touch up your shape using paint and a detailed paint brush, or you can attempt to scrape off excess paint by carefully using the side of your x-acto knife. If you are going to stretch your fabric in an embroidery hoop you can follow the instructions here. That's it. You've created a lovely little dandy for your wall. 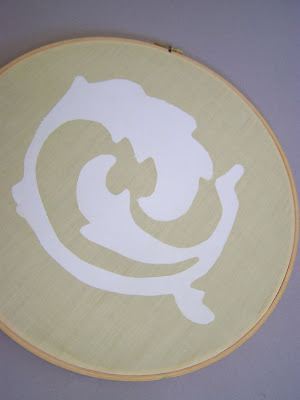 Freezer paper stencils can be used for many different things. I just finished up a project of stenciling 12 different nylon bags for girl camp (the image was a bit too detailed, and the freezer paper didn't love the nylon bag fabric, but they turned out cute). You could also use the freezer paper stencil to personalize pillow cases, sweatshirts, ect. How very cool and creative! Thanks for sharing at It's Party Time Thursday @PonyTails&FishScales!